Grand palaces, splendid feats, bustling marketplaces. The vitality and glory of the ancient Orient-home of her mother's ancestors-fascinate Ana Ming. Thanks to her great-aunt, Ana Ming can step back to the Eastern empires of long ago. Aunt Cordelia bequeathed Ana Ming and her cousins a glorious jewel. That moonstone gem magically transports Ana Ming to wherever she wishes. Guided by her sensitive spirit, observant eye, and quick intuition, Ana Ming is always ready to immerse herself in another adventure. Lively intelligence glows in her rich brown eyes. With gleaming waist-length black hair, glowing cheeks, and rose-touched lips, she has a timeless beauty. She wears an embroidered golden brocade dress, with Mandarin collar and delicate frog closures, and matching slippers. Like the noble ladies of the past whom she admires, Ana Ming’s grace and confidence make her at home in any era where she ventures. 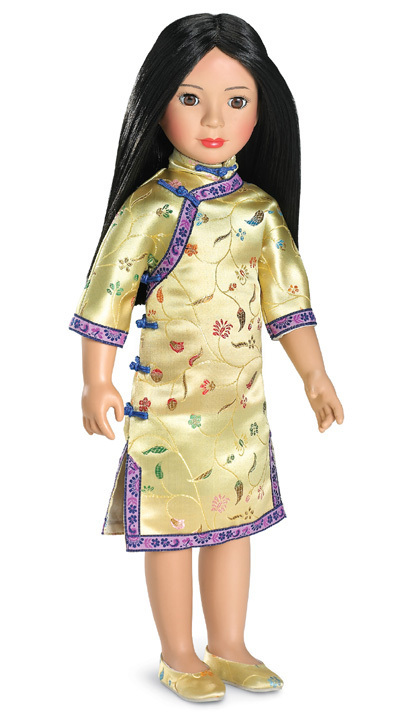 Ana Ming was created by Carpatina Dolls and introduced to the Fantasy Adventures line in 2005.